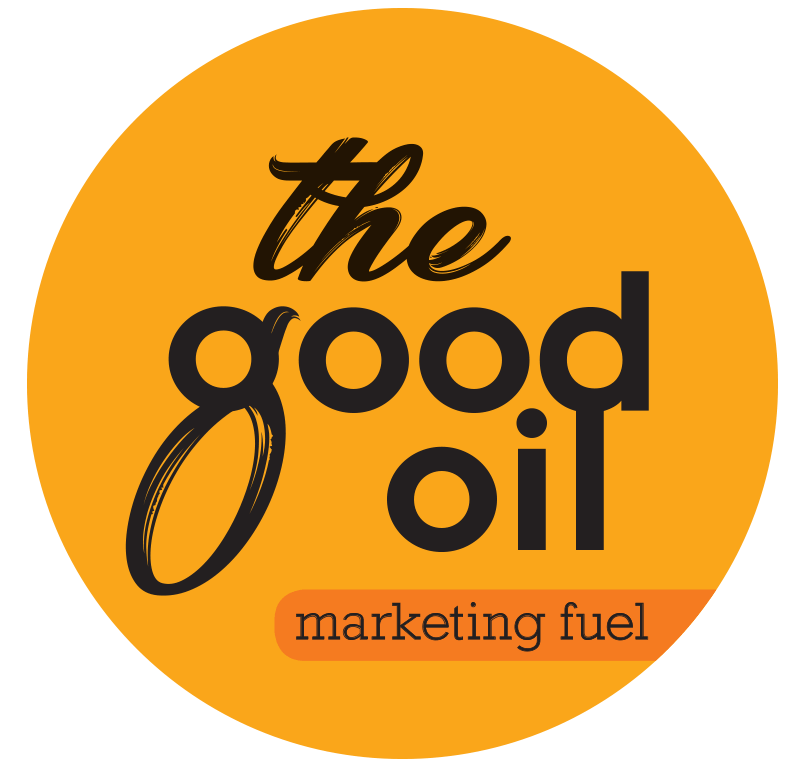 Here at The Good Oil – Marketing Dept we help people with their Facebook pages quite a bit. You know that Facebook is a great place to help grow your brand, here are the MUSTS. The idea of this article is that SOMEONE in your business takes over the task of managing the Business Facebook page, and undertakes these tasks, on a daily basis. Visit the page regularly, and become familiar with the most important areas. The first section with a red arrow is the INBOX. Almost every business we tald to now is getting an ever increasing amount of business communication via their Facebook Page Inbox. People will find your page, and simply message your page. Its like the new business email address. Like it or not, it’s the way it is. Check this tab every single day, and reply to messages as quickly as possible. We recommend 30 mins should be your worst case scenario. Faster = better. Assign someone to this task. People are expecting fast communication. There are real customers reaching out this way. The second section with a red arrow is the NOTIFICATIONS tab. 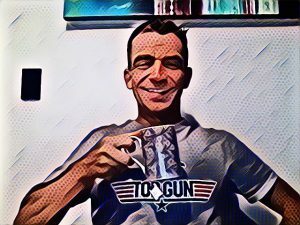 You need to check this often, to see what’s been happening on the page, check comments, answer any questions in the comments, see who has reacted to posts etc. It’s an overall look at what’s going on, and you’ll learn a lot by being across it. We have seen businesses miss all sorts of interesing and sometimes upsetting things on their page, monitor the notifications tab at all times. The third red arrow points to the INSIGHTS tab. This is very important, and we’ll talk more about it further down in this article. Take note of that tab. The fourth read arrow is your SETTINGS tab. This is where you’ll make changes to the page, update info, manage page users etc etc. Very important tab as well. Click on it now, have a look around. Is your PAGE INFO up to date for example? Website listed? Opening hours? Is there enough information in your page info so that people know exactly what you do, and what benefit they’ll get from being part of your business? STEP TWO – Learn about page insights. Let’s dive into page insights, and learn the key areas to focus on. There’s a lot in there, but if you focus on the areas that make the biggest impact, you’ll be fine. 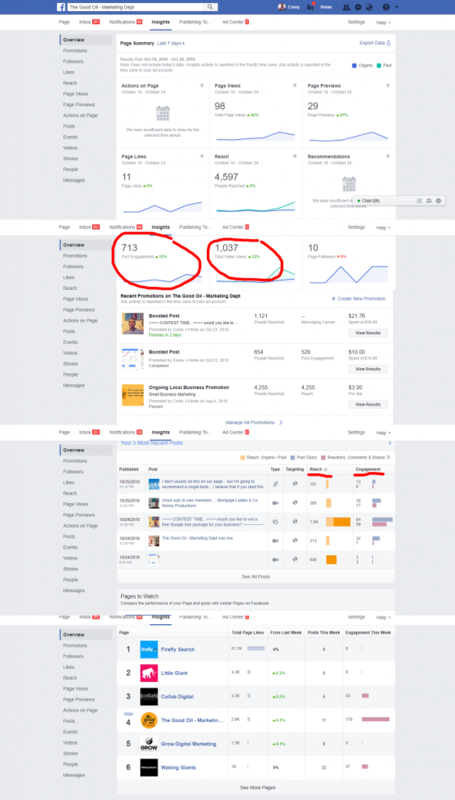 See the image below… this is my actual page, with real data. I don’t mind sharing it! First thing to note is up the top, I’ve got this set to 7 days. You can also select 28 days. I’ll often use 28 days when doing reports for clients, it’s nice to have a monthly snapshot. In my opinion, as a marketing nerd, the most important metric on here is YOUR PAGE ENGAGEMENT. This means how many people took an action on your page in that week, which includes shares, comments, and likes. This is very important. It’s no good having a million followers if nobody actually likes your content, or reacts to it. Facebook really is a SOCIAL network, and content that gets people reacting gets rewarded. I’d argue that really, that’s the whole game. No selling, just brand building, and then helping you locate interested people, to market to later on. Stand out – be interesting – get people talking about your business. This ENGAGEMENT data is something you should pay very close attention to. Aim to get as much engagement at all times. Further down the page, you’ll see some data from your own posts, telling you which posts got the most engagement. Pay close attention to this, so you can continually provide better and better content, that engages with people at higher and higher rates. My other red circle up the top of that page is the Video Views. I know, that in my business, when my videos get more views, I get more enquiries about our services, I start more conversations with people, and our ability to reach more people increases. That’s what we want! For most of our clients too, video gives better results on Facebook than any other activity, so we emphasize that a lot. It’s certainly worthwhile. I’ve underlined, in red, both reach and engagement on posts. I explain it like this. Reach is how many people see your stuff (kind of decided for you by the Facebook algorithm), and engagement is how many people take action (up to the quality of your content). If these numbers are going up, that’s good. Bottom line is…. Learn about what’s engaging, and what’s not. See at the bottom of that image how you can follow other pages? Load that feature up with your business competition so you can also learn from them. You can see how they are going with quite a few metrics, but the best aspect is that you can see which posts are going well for them, so you can learn from that. What can you apply to your page? Each day, someone needs to visit your actual Facebook Page posts, and take a few actions. Are all comments on your posts replied to? You can reply both as your page, or as yourself. They are both useful. 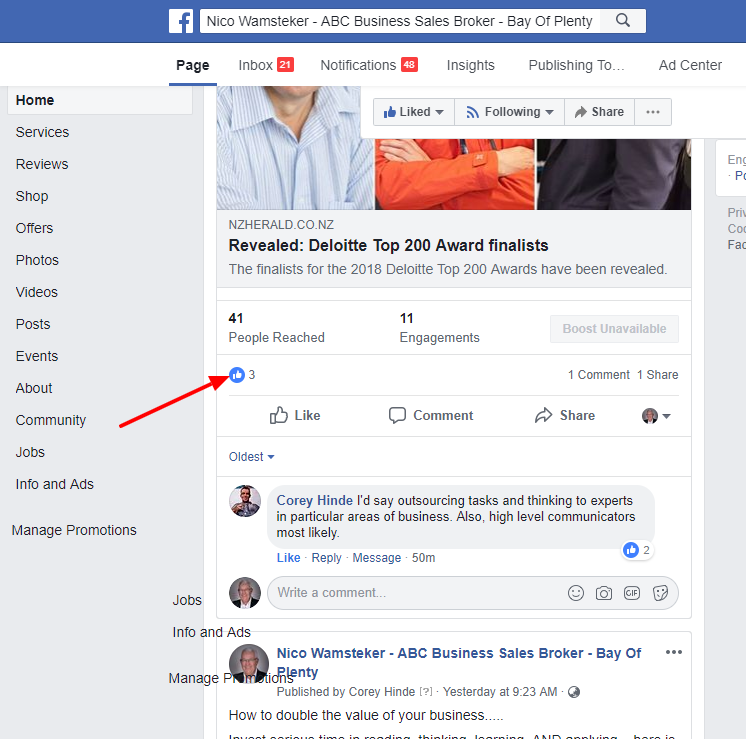 If you look at the image below, the red arrow indicates a toggle that if you click, will allow you to switch between your personal profile, and that of any pages that you manage. Next step is to ensure that anyone who has LIKED your post, also LIKES your page. Very often, people will see a post of yours because a friend has commented or shared your post. They will like the post, but haven’t yet liked your page. This is a GREAT and EASY way to generate more likes for your page. If you click on that icon indicated by the red arrow, a list of people who have liked your post will pop up. You’ll see a nice easy, INVITE button next to their name, if they are yet to like your page. Click that button…. You should try and do this as quickly as possible so that they remember your post, and are more likely to take action and like your page. Next step is to think of places you can SHARE your posts. Any relevant groups? Your own personal page? Shares can drive a lot more eyeballs to your posts. Do this often. 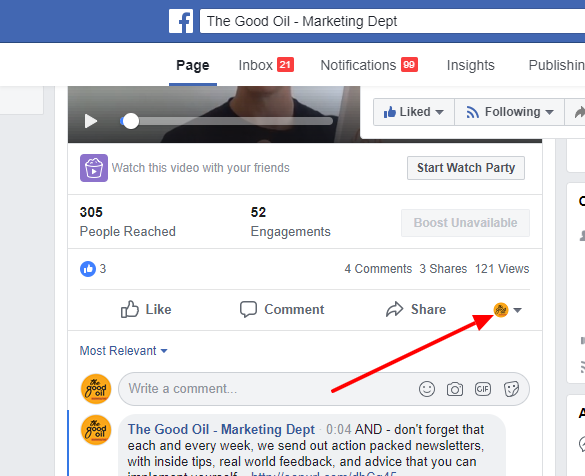 If you are in Facebook Groups where you are likely to want to share your posts, ensure you have been in there for a while beforehand, added some value, built some relationships first. Be aware of the group rules that apply as well. You DO NOT want to be that spammer who gets booted out! Can you buddy up with any other pages, that have a similar ideal client but are not competition to you? Can you approach the owner of that page to see if you can share each others content, adding value to BOTH businesses? This tactic works incredibly well… also works if using contests for your page. Keep it in mind, how can you make 1+1 = 3 if you get my drift? This really is the key. Don’t sell, don’t be spammy, don’t ask. GIVE GIVE GIVE. Be interesting. Be different. Stand OUT! Facebook is about building community, getting people talking, and finding some people who are interested in what you are doing. What can you put out that’s helpful? What advice can you give? What can you shoot a Facebook live about that will help your ideal clients learn something? Remember – you want to add value, give advice, show that you know your stuff, and hopefully do things with your page that get other people commenting, sharing, and becoming interested in what your business is all about. Once your page has gathered data about who is interested in your page, you’ll be able to remarket to them later on. Bit more advanced, but certainly something we can help you with in our free Facebook Group HERE. STEP FIVE – Learn more about your page followers. If you check the image below, you’ll see a whole bunch of options within the SETTINGS section. There are quite a few areas in here of interest, but my reason for highlighting this particular feature really is what marketing is all about… learning more about your people. 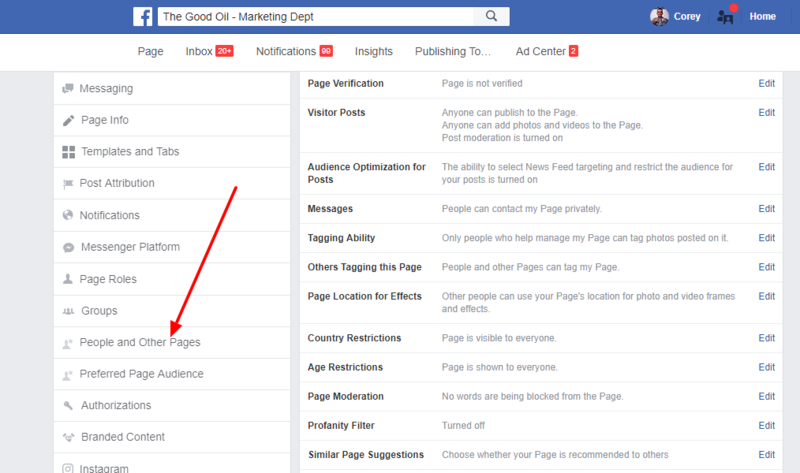 If you click on that “People and Other Pages” tab, you’ll be able to see who is actually following / liking your page. This will allow you to look at some people’s profiles from time to time, and get a feel for who is interested. The more you can learn about people, the more effective you will become at marketing your business. If my brother reads this.. He’ll laugh right now…. Yes brother, I’m researching…. Bit of a family joke. All good fun…. 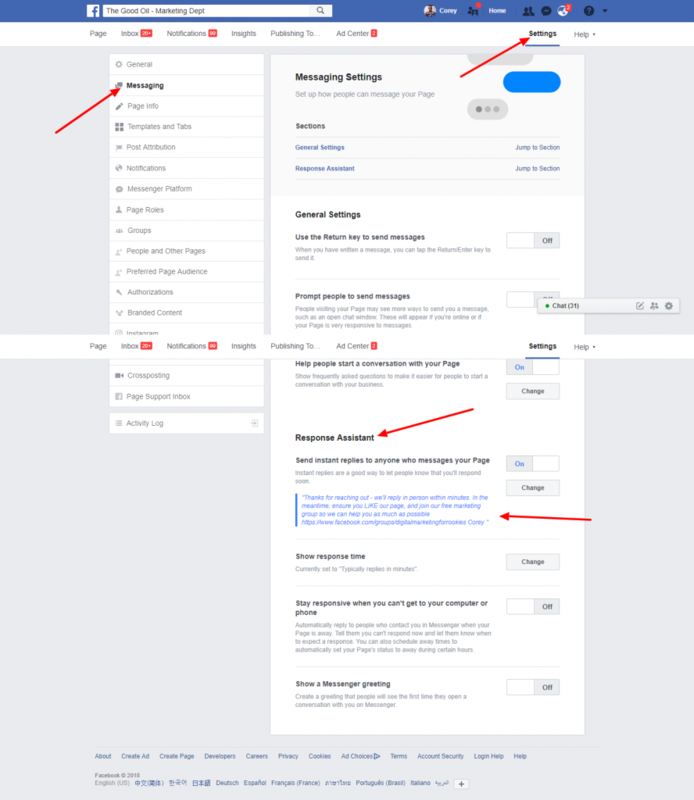 STEP SIX – Set up your page messaging. Back to people being able to communicate with you and your business. Setting up messaging is very important, because people want to talk…. NOW! Good or bad… but we can help make this a smooth, professional looking element to your business. Click on SETTINGS then on the left hand side MESSAGING. If you scroll down the page you should turn on your RESPONSE ASSISTANT and within that, you can customise your automated reply. This will make the person reaching out feel good, and you can even put in an action to take in there. We’ve got a suggestion that they join our free group. Not a sell, but a value add to the potential client. You’ll also see RESPONSE TIME. If you are keeping up to date with your messages, you can change this to “typically replies in minutes” as we’ve done, it looks sharp!